Imagine yourself standing on Earth four billion years ago, or two billion years ago or one billion years ago. Suppose you didn’t have to leave the trip to your imagination. Suppose you could be a Deep Time Traveller; spending a few days on an excursion through time with a guide to show you what to look for and explain what you find. Well, we can’t let you use our Deep Time Machine yet (health and safety will not allow it, I'm afraid; the Li-ion batteries for the quantum foam bubble-blowers have gone up in flames on every trip so far! ), but we can sell you the travel guide. It’s entitled Fungal Biology in the Origin and Emergence of Life, written by David Moore (Published March 2013; ISBN-13: 9781107652774). This book examines the progress of life, as we understand it. Starting from the origin of the solar system, the book deals with the origin of life and its onward evolution. And all in a form accessible to the general reader. In a very real sense, the book is a tourist guide, taking its readers on a series of Deep Time excursions. Let’s have a look at an outline of the Deep Time excursions you can expect to take. You might like to watch the formation of the Earth and other solar planets on a trip to the planetary accretion disk (with optional side trip to the formation of the Moon during your return) of about 5.5 billion years ago. The spatial location will be well above the plane of the Earth’s orbit around the sun. This location will keep us safely away from the main chaos of gas, star fragments, dust, comets and planetesimals as they collide and interact to fuse together and grow into recognisable planets orbiting the young Sun. For those who have tickets, the optional trip to the formation of the Moon will be a short visit to a place in time when you can see a planetesimal roughly the size of present-day Mars (a third or half the size of Earth), which is sometimes called Theia, collide with the Earth late in Earth’s growth process. The rocky debris from this impact exploded into orbit around the Earth and gradually aggregated into our Moon. Our second excursion will be a trip to four billion years ago; to watch the great Hadean age bombardment, when comets and meteorites rained down on the primordial Earth, day after day; the comets filling the oceans with water and the rocky meteorites scarring the surfaces of the Earth and Moon. After witnessing such a violent start to the story we’ll welcome an excursion to the relatively stable Earth of 3.5 billion years ago. This is the age when chemistry came alive and the first living things finally emerged. Then our programme moves on quickly to visit the Earth of 2 billion years ago to see a planet dominated by bacteria long before the emergence of higher organisms. This is a free day when you can spend your time as you wish but if you choose any of the side trips you will need full protection suits because it will be a billion years before there’s any oxygen worth breathing in the atmosphere. Next we dive to 1.5 billion years ago in search of the last common ancestor of all the higher organisms (or ‘eukaryotes’). 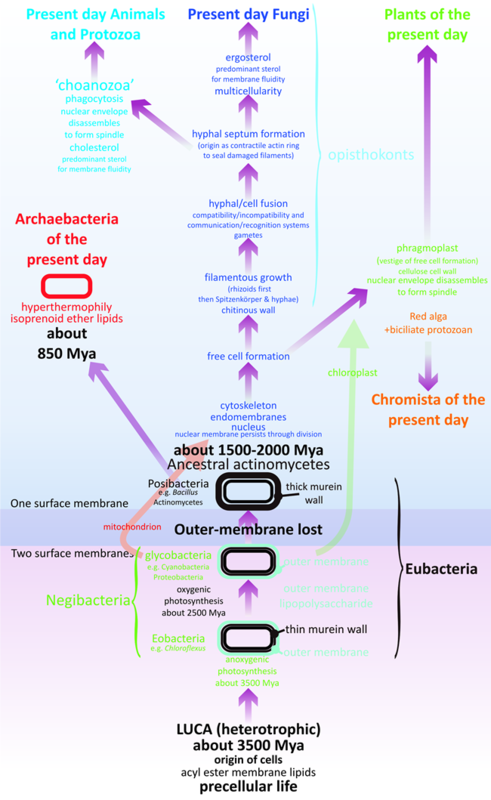 This organism probably existed for close to a billion years before evolving into the plant, animal and fungal lines that we know today. In our excursion to 1 billion years ago we will find land surfaces in coastal regions around oceans, inland seas and along rivers covered in photosynthesising microbial communities. The great majority of these will be cyanobacteria and not all of them are green, but their photosynthetic activities are sufficient to produce detectable atmospheric oxygen by the time we arrive. On our return we will stop off in the late Precambrian (about 850 million years ago) and expect to see a really green Earth and find the first true plants in the form of green algae. Don’t expect to find any animals, though. At this time animals and fungi had not diverged and were jointly represented by a group of unicellular organisms known as opisthokonts (it comes from the Greek and means ‘posterior flagellum’ - you know, like those on animal spermatozoa or fungal zoospores). It will be another 200 million years before these fungus-animal single cells diversify to take on the distinctive life styles we now know as animals and fungi [VIEW evolutionary tree]. In a really exciting excursion to the Earth of 500 million years ago we’ll visit the Age of Giant Fungi. The first really large terrestrial organisms were large multicellular fungi that probably took advantage of the previous 2 billion years’ worth of accumulated bacterial and algal debris. 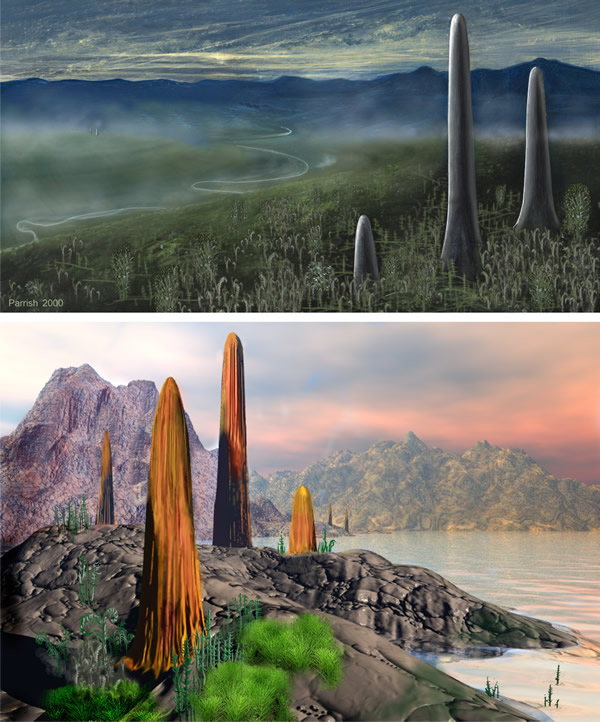 These fungi were extremely large (fossil specimens, called Prototaxites, are up to a metre across and several metres tall), and so common that they were a major component of these early terrestrial ecosystems, both in terms of abundance and diversity [VIEW landscape]. The physical dominance of Prototaxites lasted at least 40 million years (about 20 times longer than the genus Homo has so far existed on Earth). Prototaxites was the largest terrestrial organism to have lived up to this point in time. Even though vascular plants can be found in these landscapes, the principle primary producers were cyanobacteria (blue-green algae), eukaryotic algae, lichens and mosses, liverworts, and their bryophyte relatives. Don’t miss our Catastrophe Excursion! This is a busy day trip during which we will visit all the major catastrophic extinction events that have occurred during the evolution of life on Earth. We will thread our way between meteorite and comet strikes, volcanic eruptions and ice ages to follow the changing fortunes of living things. In each case we will see the common feature of massive extinction events: though animal and plant life suffered catastrophic death and destruction the fungi proliferated. While the rest of the world was dying, the fungi were having a party! On our final day we will be covering the last 500 million years of the Earth’s history. We will see some of the remarkable mutualisms between animals, plants and fungi that are so important to both natural and agricultural ecosystems today. After lunch, we’ll visit the Eocene, about 40 million years ago, to see how herbivore browsing mammals became major components of the fauna at about this time. We will also begin to understand how the grasses owe their success to the fungi in their roots that helped them respond to the environmental pressures faced by plants during the evolution of the savannah grasslands of East Africa. Add to this the fact that grass-eating ruminant mammals owe their success wholly to their symbiotic relationship with the fungi in their stomachs and we begin to appreciate that thanks to fungi those early humans were able to find their staple cereal foods among the grasses and their main food animals among the ruminants. And if all that doesn’t stretch your imaginative powers enough, try imagining the amazing fact that in the whole history of publishing this is the first book ever to set out in a systematic way those aspects of the cell biology of fungi that make them so clearly different from animals and plants, and explain how fungal evolution contributed so critically to evolution of all higher organisms.